Pulikozhambhu is a typical Tamilnadu dish and it's popular especially in Tirunelveli homes. 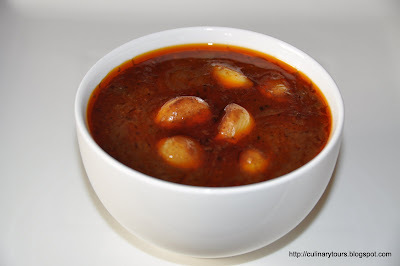 Pulikozhambu is a spicy and tangy gravy made mainly with the tamarind pulp and added ingredients. Soak tamarind in water for 10-15 mts. Squeeze the pulp with the hands and filter it through a seive to avoid the fiber and small bits and pieces of the tamarind. Keep it aside. Peel off the skin from the garlic cloves. Roast all the masala ingredients in little oil and grind them to a fine paste using little water. Take oil in a kadai. Temper the mustard seeds, urad dal, fenugreek, and hing. Add curry leaves and garlic cloves and saute them until the garlic becomes slightly soft. 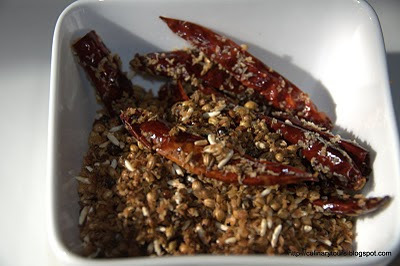 Meanwhile dissolve the ground paste along with salt in the tamarind liquid . Add the liquid to the pan and let it cook in medium heat for 30 to 40 mts till the liquid reduces to half. Add gingelly oil to the pan while the gravy is simmering. 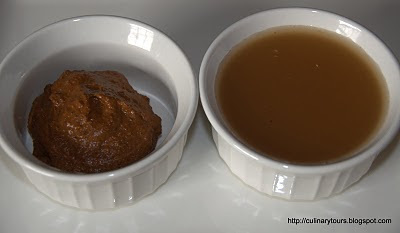 Adding gingelly oil is a must to this gravy as it imparts unique flavor to this dish. 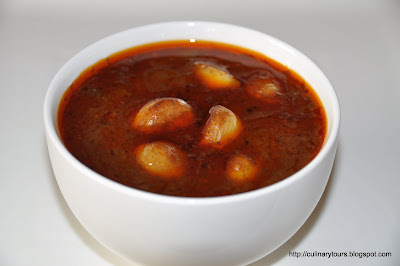 You can make this gravy with dried vathal or cooked Mochai( Field beans). You can also add onion vadagams while tempering .